THE STORY OF ARCHITECT DUO Marie and Keith Zawistowski begins with a truckload of 72,000 carpet tiles. They were both 21 years old, and had enrolled in Auburn University’s Rural Studio Outreach Program to study under Professor Samuel “Sambo” Mockbee with four other students. Over the course of a school year, the studio designed and built the now-iconic Lucy House in remote Mason’s Bend, Ala. The gently rolling lines of thick colorful stacked carpet walls outlined by grainy yellow and brown plywood trim offset by a crinkled purple tower shooting towards the sky was no easy feat for a group of students. Yet, designing and building was only half of the Lucy House experience that has since shaped the Zawistowski’s practice. “Sambo took us around on what he called his ‘Southern Odyssey,’—the building traditions, the food, and music of the South. We became totally immersed in that culture—learning about the value of rooting architecture in place,” the Zawistowski’s described. As many Rural Studio students can attest, Sambo’s legacy of contextually relevant, socially conscious, and environmentally sensitive design has influenced many practices around the world. The Zawistowski’s developed their design/build practice, OnSite Architecture, immediately after finishing the Lucy House. “When we left the Rural Studio, we continued designing and building. We never stopped,” said Marie. ‘OnSite’ is the driving principle behind the Zawistowski’s practice: they only design and build within the context of each project, with the people and within the place. The wood deck plane bends and folds creating floor space and walls. After working in Marie’s native country of France for several years, the couple received a Graham Foundation grant to research traditional building techniques in Ghana. They published a book from their findings titled The Builders of Ghana: Traditions of Today and Tomorrow, which led them to present their work at Keith’s alma mater Virginia Tech in Blacksburg, Virginia. After the presentation, both Keith and Marie were offered a teaching position at the School of Architecture and the design/buildLAB was conceived—almost ten years after the completion of the Lucy House. “When we were [at the Rural Studio], Sambo told us something that really resonated with us:it would take us ten years to fully understand the complexities of what we learned at the Rural Studio,” said Keith.“Ten years later was the beginning of the design/buildLAB when the Covington Farmers Market opened.” It looks like Sambo was right. The community comes together to use the amphitheater for dance performances. They realized that the newly vacant piece of land had the potential to be a cultural anchor. The lighting of the amphitheater and the bridge create a wonderful ambience at night. But before they could begin designing and building the park, a major blockade stood in the way. A 100-year-old saw mill that had been turned into a tire-retreading factory sat on a prime piece of land in the center of the town. The design/ buildLAB worked with three local entities—a foundation, the government, and a nonprofit—to organize a land and material swap. Fortunately, the tire-retreading business owner didn’t need too much convincing to relocate. “[He] was excited to move to an industrial park outside of town. So the town and local government came together to buy him a new warehouse that improved the efficiency of his business, freeing up the prime piece of land for public use,” recollected Keith. It was a win-win: the business owner moved to a better area, the town captured a key piece of land, and another design/buildLAB project in the neighboring town of Covington received a huge stock of aged wood from the disassembled saw mill. During the students’ investigation into Clifton Forge’s economic development, the arts and crafts community was taking shape. A fledgling School of Art was starting up, the town was beginning to renovate the historic theater, and artists were moving into the unused buildings. From their interviews with the locals, they realized that the newly vacant piece of land had the potential to be a cultural anchor where artists, business owners, and the community at large could convene—collectively pointing towards a need for a public performance space. Perhaps the most significant outcome resulted in the students working with local contractors who volunteered. The metal panels along the stage walls shimmer in the night lighting. Like typical architecture school studios, students first designed individual proposals for the site, taking into consideration sun, wind, natural elements, topography, history of the place, and, in this case, the larger master plan developed for the site based on interviews with the community. However, to arrive at a buildable scheme from sixteen individual ideas, the design/buildLAB took a different approach. The students iteratively merged their proposals for the amphitheater and presented the schemes to the clients and community members along the way. “Getting to meet the clients and getting to see where a project would actually be located and how it would impact that community was totally different. 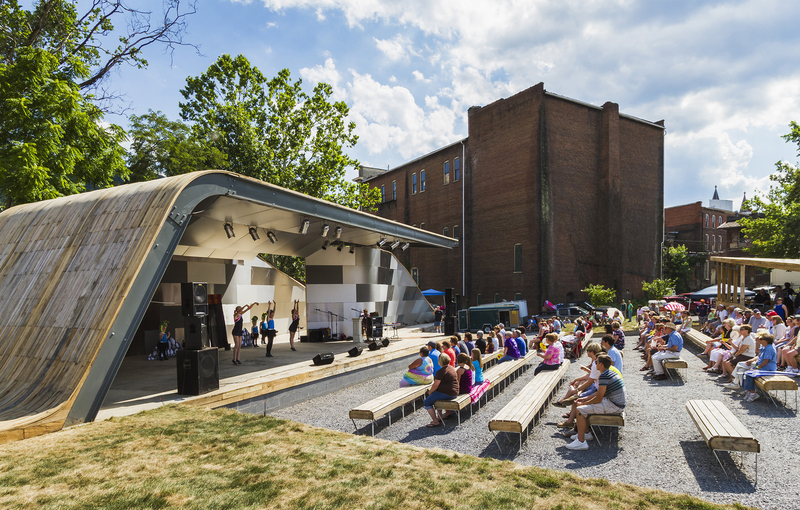 We are usually given a piece of paper with a brief and maybe you do a site visit but you never really meet the people who make up the that community,” recalls design/ buildLAB participant Leah Schaffer who worked on the Masonic Amphitheater. The large group work methodology took time to get used to as well. In other group projects, students are able to select their team members, typically two to three people, who are familiar with each other’s work ethics. Working within a group of 16 is like managing a small firm, as Keith and Marie refer to the design/build LAB. 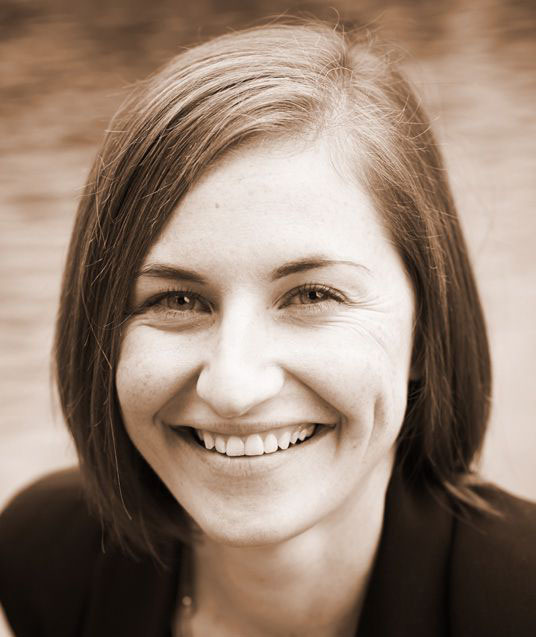 “It was difficult in scheduling and getting things done,” recalls Leah. The decking bends and moves to create seating and planters. The design/buildLAB students assemble the deck components. The deck separates to create a backstage entrance. Through more conversations with the clients, community, and consultants became a richer design and new insights that the students learned to communicate. 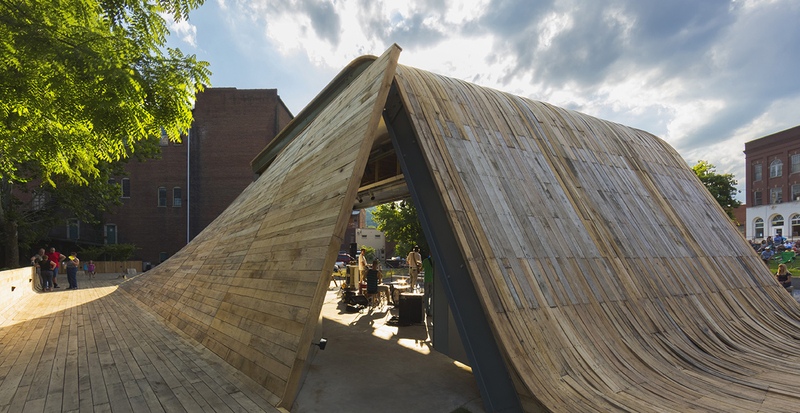 For instance, the amphitheater’s swooping form responded to the need for a lowtech acoustical solution. “The students talked with the community about the shape of the building being driven almost exclusively by the acoustic model to project sound into the audience without amplification,” explained Keith. Over the course of a semester, the group arrived at a final scheme developed through consensus rather than competition, accounting for the students, consultants, community members, and town’s ideas. “We anticipated tension every time and it’s almost always been 100% consensus, both from a student and community perspective,” said Keith. “They realized the value of consensus building.” At the end of the first semester, the design/build team had an elegant sweeping form containing an acoustic shell, a backstage with a loading dock, and a green room and wings, along with a seating area and a sound and lighting control booth—and a site ready to receive it. 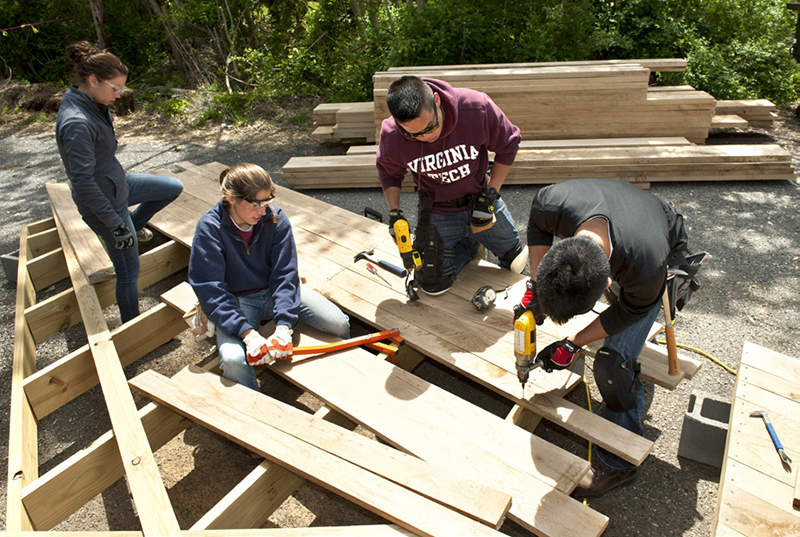 The team eagerly began the second semester ready to build the Masonic Amphitheater. As with all construction projects, the common challenges of physically demanding work and inclement weather challenged the group. However, the amphitheater utilized new and old technologies to assemble the majority of the components offsite. The band shell’s structure was constructed of prefabricated wood trusses; its shape was determined by a 3D model produced by the students. By working with a local manufacturer who machine-fabricated the wood trusses, the team was able to minimize the typical waste in materials and time of hand-fabrication. 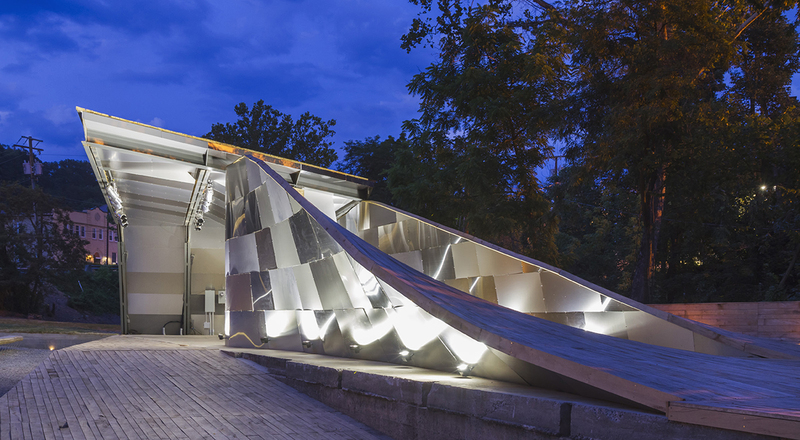 Additionally, the metal composite panels that clad the band shell’s curvaceous backdrop were individually cut using Virginia Tech’s CNC router. Along with minimizing time with new technologies, the team sped up the construction by working in two different locations. 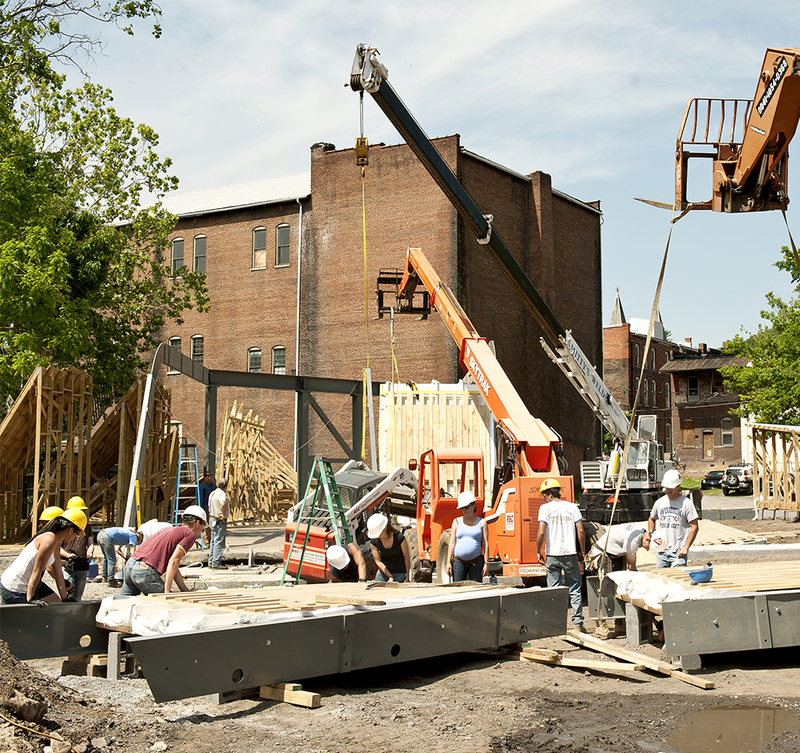 While a local contractor completed the foundation work and utility connections on site, students were busy prefabricating the Amphitheater’s floors, walls, sound booth, roof panels, and benches back at the university’s facilities. This allowed for two phases of construction to proceed simultaneously, resulting in a prefabricated and assembled structure completed in less than four months. The Zawistowskis supervise the construction of amphitheater. The selection of materials played a significant role in blending the past and future of Clifton Forge.One significant moment that defined the design direction came after a community meeting when one of the locals left the meeting, arrived home, and then drove back to the meeting location. “He told us that [Clifton Forge] was an old railroad town so the building should be ‘semi-rustic,’” said Marie. Although some designers may shy away from this direct request, the team understood his insight into the place and used this—perhaps even subconsciously—to shape the project. 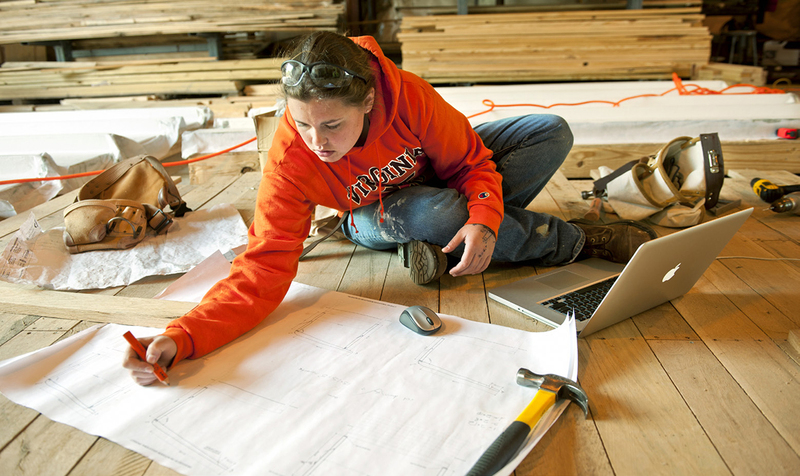 A design/buildLAB student interprets the construction documents during construction. A design/buildLAB student saw-cutting on site. offset the ‘rustic’ wood cladding, indicative of the emerging future of Clifton Forge as a place that is resurrecting itself with the help of the Smith Creek Park. Building a project in a place with an extremely limited budget resulted in the students learning to be resourceful and creative in sourcing materials along with establishing a committed network of volunteers. The team received a grant from The Alleghany Foundation in an amount of $150,000 and relied on significant in-kind material donations from local, national, and international product manufacturers. Perhaps the most significant outcome resulted in the students working with local contractors who volunteered to help with the construction. “Usually there is an adversarial relationship between architects and builders. Amphitheater’s surface and just a few hours later, the Clifton Town residents arrived to celebrate the official opening of the new gleaming gem in their town center. “To see the public using it and enjoying it—that was the most rewarding moment,” recalled Leah. For Keith and Marie, it’s a reminder of the capacity that they themselves had over ten years ago. “It’s always amazing to see a group of 21 year olds pull off something this impressive,” said Marie proudly. 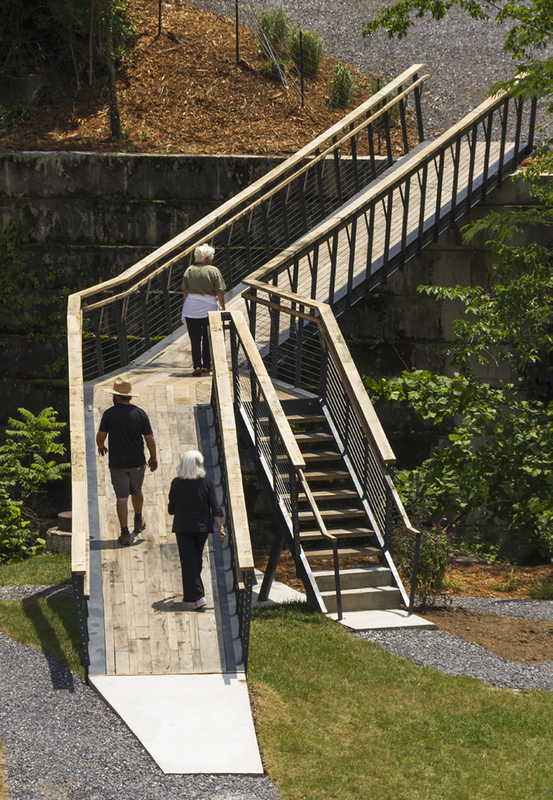 "To see the public using it and enjoying it - that was the most rewarding moments"
The Smith Creek Pedestrian Bridge connects Clifton Forge's historic downtown. In the Spring of 2013, a new studio of students took on the second phase of the Smith Creek Park redevelopment. 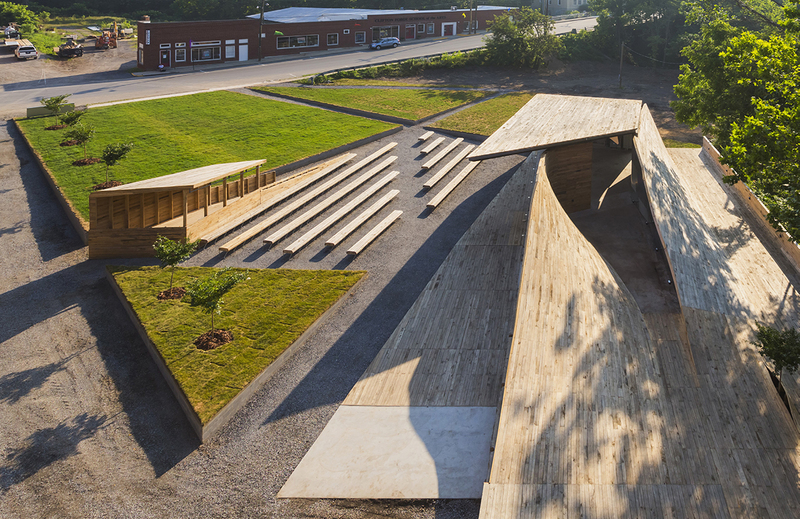 “The Amphitheater project was crazy ambitious in terms of scale,” said Keith. “We were joking after the end of the Amphitheater project that we needed to do a dog house—something much smaller.” “So we did a bridge,” laughed Marie. 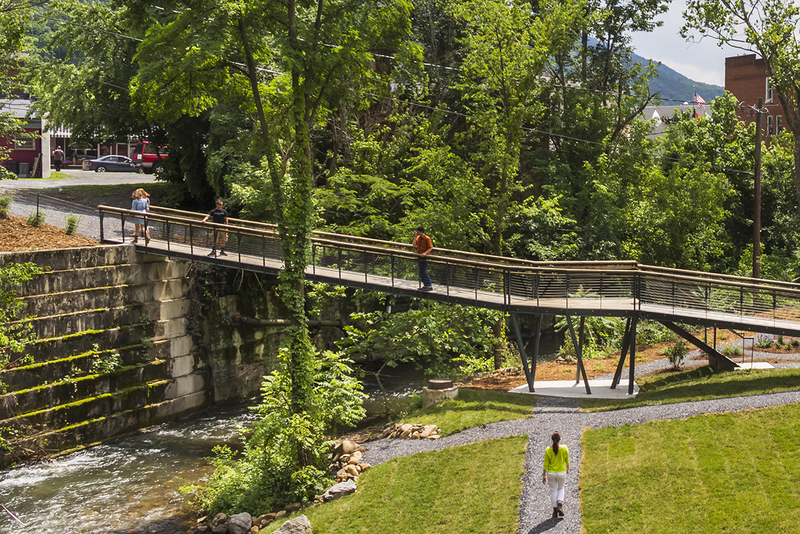 The Smith Creek Pedestrian Bridge is a bent pathway that ramps out of the park’s landscape to link the new Amphitheater to Clifton Forge’s historic downtown. The students participated in a similar process to conceive the final bridge and landscape design: first working on individual proposals based on the overarching idea for the park, which were then combined into a final design with input from the local government, community members, and consultants. The public using the bridge. curved handrail and wood floor. Finally, the students worked with a landscape architect to introduce a mixture of green areas into the park. A line of tall grasses dances along the river’s edge alongside a beach area where residents can escape on warm days. A labyrinthine butterfly garden lies next to the Amphitheater, along with a series of grass lawns providing picnic and play space surrounding the stage. 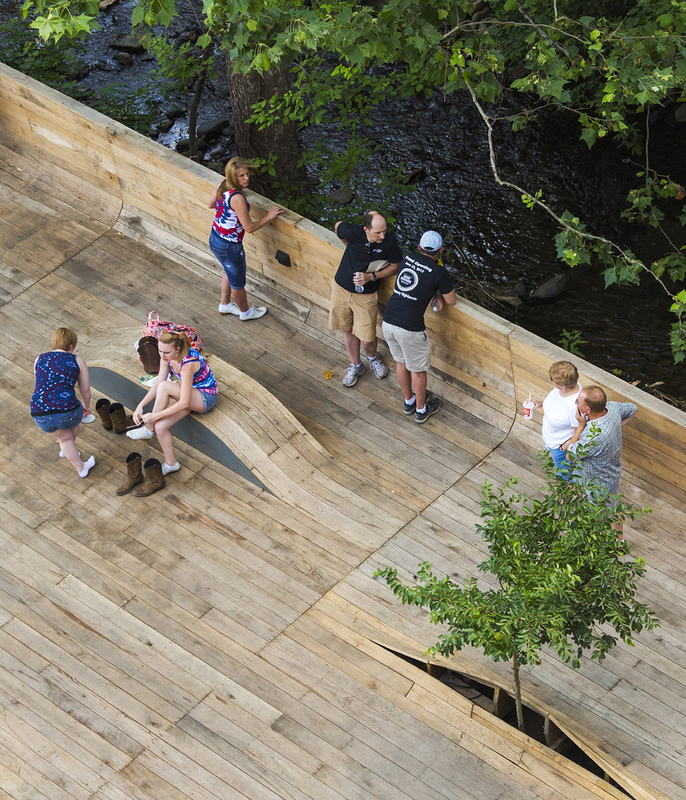 This textured environment links the natural landscape of the creek, with the sculptural forms of the park’s built elements, and the historic town. Since the opening of the Masonic Amphitheater and Smith Creek Park, Clifton Forge has seen an influx of activity. 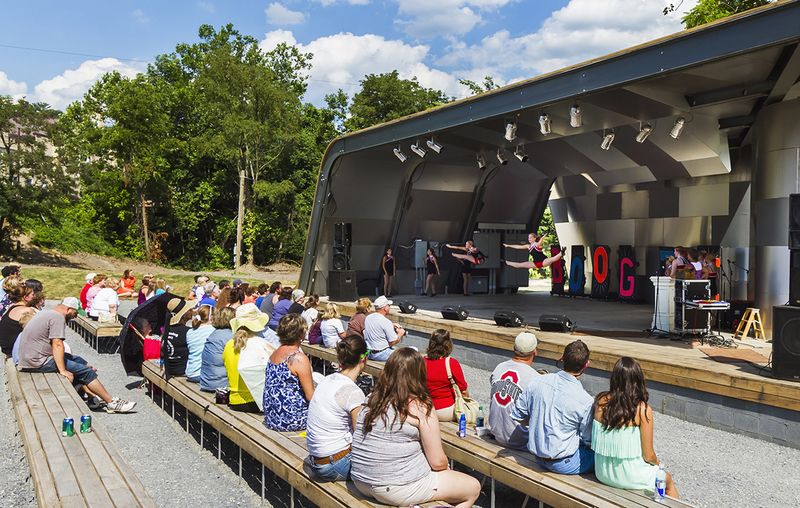 In 2012, the Amphitheater hosted 15 performances, which grew to 42 events in 2013,and now has more than 50 scheduled for 2014.Musicians, dancers, theater troupes, and youth performances continue to take the stage by storm, drawing hordes of locals to the park weekly—sometimes even daily—to infuse energy into Clifton Forge’s downtown. Along with the recognition by American Architects, the 42-minute documentary film, Reality Check, created by filmmaker Leon Gerskovic, told the story of the design and build Masonic Amphitheater from start to finish. It has been screened nationwide, bringing the story of this architecture studio’s accomplishment to other architecture schools and design communities. Most recently, the entire Smith Creek Park development was voted to receive an Architizer A+ Award for Urban Transformation by the larger design community. This notable recognition highlights the significance of a beautiful, modern project developed with a small town community. Now entering its fifth year, the design/build LAB is growing into its adolescence stage. The Zawistowski’s are part of a committee of representatives from Alleghany County, which includes members from a local foundation, town managers, regional economic development experts, and representatives from the Chamber of Commerce. The architect duo has defined a set of criteria with community members to determine and prioritize the most impactful projects to develop with the Virginia Tech students, solidifying the significance of the LAB’s role in the wider community. “We’ve grown to value the idea of the local architect and the ability to have an influence on a place by being in a place,” said Keith. “There’s a network of trust that you build and you can have a much greater impact with each project when you don’t have to build that network from scratch each time.” “And vice versa—the community will trust you because they know you well,” said Marie. Stephen Perry, Fernanda Rosales,Leah Schaffer, Katherine Schaffernoth,Amanda Schlichting, Ian Shelton, Brent Sikora, Claudia Siles, Emarie Skelton,Samantha Stephenson, Taylor Terrill,Daniel Vantresca, Bryana Warner, Samuel “Aaron” Williams, Samantha Yeh.